Keep yourself warm through the colder winter months with this Hot Water Bottle from Pusheen. This cuddly little critter is sure to keep you safe and warm whenever you want a cuddle. 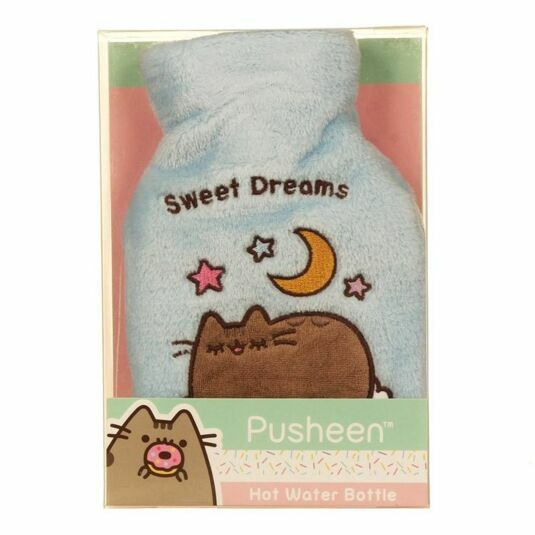 This hot water bottle is blue in colour and decorated with cute little images of Pusheen herself. She sits with her eyes closed in that contended manner that we have all enjoyed at some point. Above her are graphics of a moon and several stars, as well as the words ‘Sweet Dreams.’ This brings an instant smile to your face as you cuddle the plush little thing. This makes a fantastic gift for anyone that you know who could do with a little something to keep them warm at night; look no further than Pusheen!